[129 Pages Report] Medical Membranes Market was valued at USD 1.95 Billion in 2016 and is projected to reach USD 3.31 Billion by 2022, at a CAGR of 9.2% from 2017 to 2022. The growth of the medical membranes market can be attributed to the increasing demand for high-purity selective separation, expanding healthcare and pharmaceutical industries, and increasing number of End-Stage Renal Disease (ESRD) patients. The base year considered for the study is 2016, while the forecast period is from 2017 to 2022. The main objective of the study is to define, describe, and forecast the medical membranes market on the basis of material, process technology, application, and region. 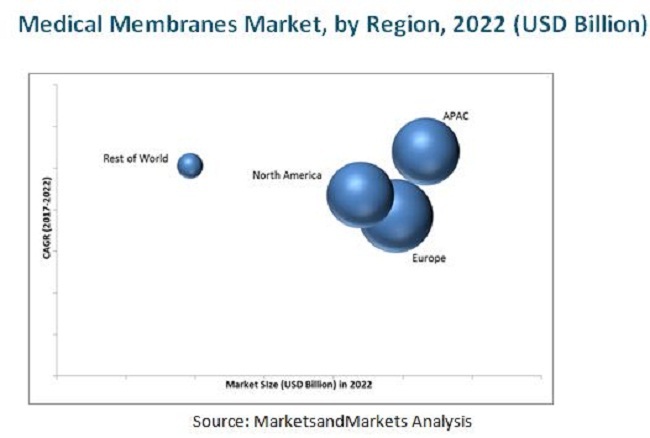 The report includes detailed information regarding major factors, such as drivers, opportunities, restraints, and industry-specific challenges, influencing the growth of the medical membranes market. It strategically analyzes market segments with respect to individual growth trends, growth prospects, and contribution to the total market. 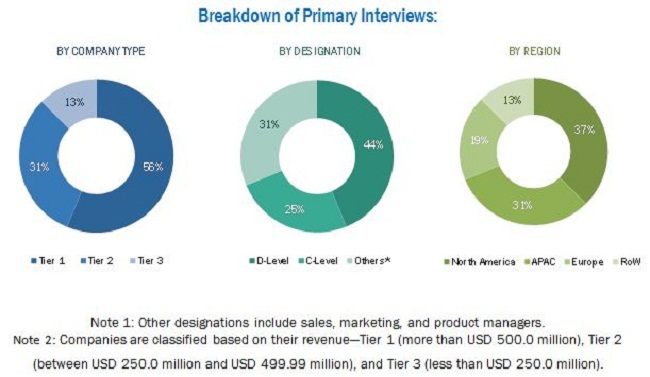 The report includes an analysis of the medical membranes market by material (PSU & PESU, PVDF, PTFE, PP, modified acrylics, and others), process technology (ultrafiltration, microfiltration, nanofiltration, and others), application (pharmaceutical filtration, hemodialysis, drug delivery, IV infusion & sterile filtration, and others), and region (APAC, Europe, North America, and Rest of the World). The market size of medical membranes has been estimated in terms of value. Both, top-down and bottom-up approaches have been used to estimate and validate the size of the medical membranes market and to estimate the size of various other dependent submarkets. Extensive secondary sources, directories, and databases such as Hoovers, Bloomberg, Chemical Weekly, Factiva, World Bank, the American Filtration and Separations Society, and other government and private websites were referred to for the identification and collection of information useful for this technical, market-oriented, and commercial study of the medical membranes market. Key players operating in the medical membranes market include Pall Corporation (US), Merck Millipore (US), 3M (US), Sartorius (Germany), Koch Membrane Systems (US), and Asahi Kasei (Japan). This research report categorizes the medical membranes market on the basis of material, process technology, application, and region. The medical membranes market is projected to grow from USD 2.13 Billion in 2017 to USD 3.31 Billion by 2022, at a CAGR of 9.2% during the forecast period. Medical membranes are increasingly used in the healthcare, pharmaceutical, biotechnology, and life sciences industries. In the medical sector, the choice of membranes depends on various factors that include environments of the proposed application, degree of sterility required, chemical compatibility, biocompatibility, and the degree of hydrophobicity. The growth of the pharmaceutical and healthcare industries, especially in emerging economies, is a major factor projected to drive the demand for medical membranes. The increasing demand for high purity products is another factor driving the growth of the medical membranes market. APAC and Latin America provide several opportunities for growth of the medical membranes market. Based on material, the medical membranes market has been segmented into PSU & PESU, PVDF, PTFE, PP, modified acrylics, and others. PVDF and PSU & PESU are the most commonly used medical membranes for the separation of media in pharmaceutical, life sciences, biotechnology, and healthcare sectors. Based on application, the medical membranes market has been segmented into pharmaceutical filtration, hemodialysis, drug delivery, IV infusion & sterile filtration, and others. The pharmaceutical filtration application segment is projected to lead the medical membranes market during the forecast period. This growth can be attributed to the increase in the production of medicated drugs and expansion of healthcare facilities. Based on process technology, the medical membranes market has been segmented into ultrafiltration, microfiltration, nanofiltration, and others. The ultrafiltration process technology is projected to lead the medical membranes market from 2017 to 2022. The increasing use of ultrafiltration process technology in pharmaceutical filtration will help increase the market share of ultrafiltration in the medical membranes market. Based on region, the medical membranes market has been segmented into APAC, North America, Europe, and the Rest of the World. Europe is the leading market for medical membranes. The growth of the medical membranes market in Europe is driven by the increasing aging population (above 65 years), growing End-Stage Renal Disease (ESRD) patient pool, increasing availability of improved diagnosis facilities, and rising incidences of chronic diseases, such as diabetes and hypertension. The long validation process for medical membranes is a major factor restraining the growth of the medical membranes market. Additionally, manufacturing quality products at affordable prices and increasing the lifespan of medical membranes act as key challenges to the growth of the medical membranes market. Pall Corporation (US), Asahi Kasei (Japan), 3M (US), Sartorius (Germany), and Merck Millipore (US) are key companies operating in the medical membranes market. Other major manufacturers of medical membranes include GE Healthcare (US), Koch Membrane Systems (US), and W. L. Gore & Associates (US). Targeting new markets will enable medical membrane manufacturers to overcome the effects of the volatile economy, leading to a diversified business portfolio and increase in revenue. 11.10 W. L. Gore & Associates, Inc.